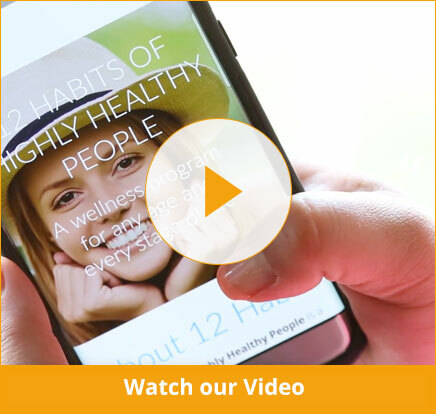 "A new approach to healthy living through the 12 Habits of Highly Healthy People® program." There is no denying that health and wellness of the mind and body are important. But how do we maintain it? There are plenty of diets, exercise regimens, and advice columns available, but often they are difficult to put into practice and only address one aspect of overall health. The 12 Habits of Highly Healthy People® program stands out from conventional wellness programs in that it addresses all aspects of an individual’s physical and emotional health and is easy to implement in daily life, regardless of age, physical ability, or circumstances. The program from 12 for Health can also be tailored to fit each individual’s goals and priorities. Participants won’t have to make dramatic or unrealistic lifestyle changes to achieve results. 12 for Health President, Kerry Olsen, MD, of Mayo Clinic, began exploring why some patients seemed to be experiencing more satisfaction in life than others. This led to research in which he identified 12 habits consistent in individuals with greater health and life fulfillment. He and other experts developed a program around these 12 habits. Now, the 12 Habits program is publicly available. The 12 Habits program is perfect for individuals, businesses, or organizations who are looking to make meaningful change in their well-being or the well-being of members and employees. This unique program challenges participants, while being achievable, and is easy to implement in any environment. It can even work conjointly with existing wellness initiatives. Let 12 for Health help you discover what is truly important in living a healthy, happy life. Start the 12 Habits program for your employees, members, or yourself today! The email serves as a monthly reality check about work/life balance and is a good reminder to see if my current habits fit in with the sound advice offered by the program. This is especially beneficial as a working parent because so much time is spent meeting the needs of others that it is hard for me to spend time on myself. The monthly challenges have helped in my quest to improve my quality of life. I share the newsletter with family members; we make it a shared experience.